At 9:15 a.m. on Tuesday, May 1, over 30 students filed into Dean of Students Liz Braun’s office on the first floor of Parrish Hall. As Braun rose from her seat, the students — members of Organizing for Survivors, a group that has protested Title IX handling at the college since early March — placed their backpacks on the floor beside them and announced their plans to stay there indefinitely. It is now over 50 hours later, and neither the students nor their belongings have moved. Dean Braun had picked up her bags and left silently after Shelby Dolch ’21 delivered a statement on behalf of O4S, and by 5 p.m. on May 2, she had not returned to her office. No protesters have received citations. Dean Braun’s office, its lobby and the hallway outside have been packed with students since. Provisions for the sit-in — coffee, Qdoba catering, Federal donuts, home-baked cakes, carrots — proliferate in the office space; most were either donated by professors or funded by sympathetic alumni through O4S’s Venmo. Associate Dean of Diversity and Inclusion Shà Duncan Smith remained with students throughout the first day until around 2 a.m. and provided Chinese takeout for the group. By noon on the second day, over 175 students had participated in the sit-in and 17 students stayed overnight on the night of May 1. O4S had not publicized the sit-in outside of private meetings and a Nonviolent Direct Action training meeting, hosted with help from Sunrise, a divestment advocacy group that staged a 32-day sit-in in Parrish last spring. For many, the sit-in is a response to growing dissatisfaction with the administration. 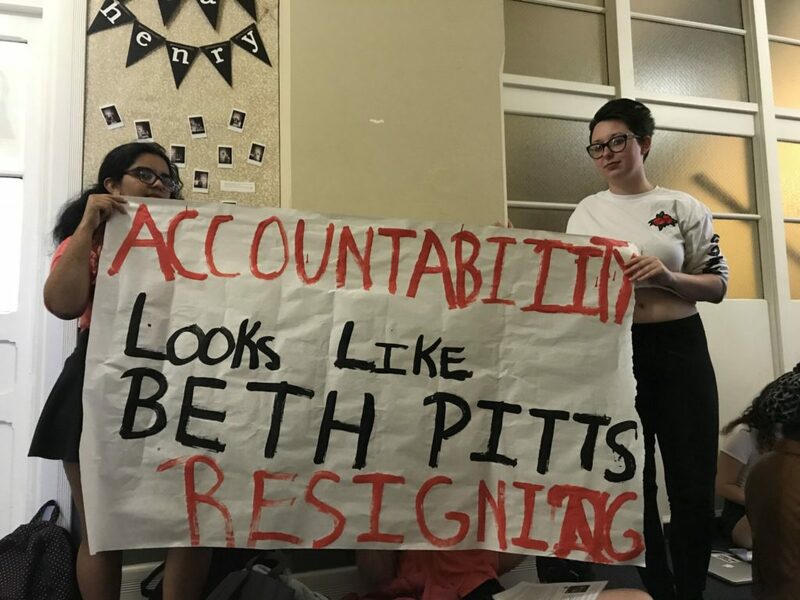 At 9:55 p.m., as protesters prepared to spend the night, two Public Safety officers took down a banner from the Parrish hallway that read “Accountability looks like Beth Pitts resigning.” Pitts is Associate Director of Investigations for Title IX cases. The officers cited a policy against “singling someone out” on banners and the policy that banners receive pre-approval five days before being hung, though the former policy is not listed in the student handbook and banners are not allowed in Parrish in the first place. They also removed two locked file cabinets from Braun’s office around 11:00 p.m.
“Per the Student Handbook, any language that is, ‘harassing, demeaning or uncivil,’ is grounds for removal. In this and other instances if the banner/poster or chalking specifically identifies a community member by name or position in a derogatory manner, it is considered ‘harassment, demeaning, or uncivil,’” Public Safety Director Mike Hill wrote in an email to the Phoenix. Other administrators who have called O4S’s methodology adversarial and uncivil include President Valerie Smith, who emailed students, faculty and staff of the college at 12:43 p.m. on May 1, alerting the community that the protesters’ presence in Braun’s office violated school policy because it prevented Braun and her staff from being able to work. Smith refers to Pitts, Braun and Dean Nathan Miller, from whom O4S has demanded resignations. At rallies during the sit-in, the group chanted songs such as “Hey hey, ho ho, ______ has got to go,” for each of these administrators as well as for frat housing. But in contrast to Smith’s assertion, O4S and supporters feel their demands are based on professional competence, not personality. For Dean Braun, O4S asks that she apologizes for her dismissal of student reports and concerns about sexual assault and mishandling of Title IX procedures. They believe that Dean Miller failed to correct violations of Title IX policies during Title IX adjudication processes, such as processes that lasted over 6 months. And they write that Beth Pitts asked victim-blaming questions and “belittled” complainants. “I am evaluating every allegation that has been brought against members of the staff,” President Smith wrote to the Phoenix. O4S addressed those who disagree with their tactics at their Speak-Out rally on May 1. O4S core members Priya Dieterich ’18 and Lydia Koku ’18 feel that their movement is not unnecessarily combative towards administrators. “These are controversial demands and because of that people see them and our accompanying tactics as adversarial,” Koku added. In addition to her update on the sit-in, President Smith’s email included a copy of an email that Dean Braun had sent to O4S members after they met the week previous. O4S had not replied. In the email, Braun states that she will create a “student transition team” that will work with the new Title IX Coordinator and Violence Prevention Educator, that the ad hoc committee on wellbeing, belonging, and social life will release their report on the fraternity houses by July, and that she will oversee the creation of enhanced training during freshman orientation, among other updates. Yet according to O4S members, Braun’s decision to create a student transition team does not solve the issues they’ve identified. O4S has consistently pushed back against administrative suggestions about committees and external reviews, asking instead for immediate action. At 8:45 a.m. on the second day of the sit-in, a handful of O4S members walked into a meeting of the same ad hoc committee to which Dean Braun referred in her email to ask questions directly to Deans Braun and Miller. “How many times will you make survivors retell their stories and retraumatize themselves to committee after committee year after year before it means enough for you to take action?” Anna Weber ’19 said to the committee. The room was silent after O4S delivered their questions. “I think that’s revealing,” Dieterich said before leading the group out of the meeting. Afterwards, the protest intensified. At noon on May 2, over 150 students lined the Parrish hallway to hear a “special announcement” that O4S had publicized that morning on their Facebook page. They announced their decision to expand their sit-in to Dean Miller’s office as a result of the events of that morning; they said they had planned to address Dean Miller, but could not, as he was out at lunch. Both The Philadelphia Inquirer and PhillyVoice published news stories online about O4S.NBC News Philadelphia continuously aired and posted two clips of video coverage of the sit-in. Students in the organization expressed anger after hearing that the college had removed NBC journalists from campus, as multiple students posted on the “Swarthmore Memes for Quaker Teens” page with memes about the “banning of free press” on campus. One of NBC’s clips was titled “Swarthmore Students Stage Sit-In to Protest Sexual Violence.” Yet what distinguishes O4S’s protests from broader national movements such as #MeToo is its focus on the Swarthmore administration over cultural issues, according to Koku. For Koku, leading O4S during her last semester at the college, despite the challenges she’s faced — which included the fear that she would not receive her degree — changed how she viewed herself and administrators at the college. Because all of O4S’s original core members except one are graduating seniors, the group made efforts to recruit underclassmen to take leadership for next year. Underclassmen such as Dolch held larger roles in the sit-in than they had previously. According to Dieterich, the timing of the sit-in, two weeks from the end of the year, worried her, but the turnout exceeded her expectations. “A lot of what we’re doing and my willingness to do it publicly in this way is just that I want the concerns of people who are in my year not to be waited out and not to be buried,” she said. As of the publication of this article, O4S has not announced an end date or condition for the sit-in. “I deeply regret any pain or burden students have borne unnecessarily due to our Title IX processes and procedures,” President Smith wrote in her email to the Phoenix. Dieterich, too, regrets that students will continue to spend time on the movement.